This page will be updated on a regular basis, to show some of my latest photos and to set out a little bit of information about when and where they were taken. You can also Click Here to see an slideshow displaying the most recent photos that I have added to the Galleries. This fantastic animal is a female Cheetah (Acynonyx Jubatus). With their slender build, Cheetahs are built for high speed pursuits of their prey. Their dark, lachrymal tear-like markings below the eyes are thought to reduce glare from the sun when they hunting. This young lady is bearing her teeth whilst aggressively guarding her food. The image was taken at Exmoor Zoo in May 2018. One of the joys of spring, is the return of the Osprey (Pandion Haliaetus) to the United Kingdom. These rare, stunning migratory birds winter in West Africa, before flying north to breed during our summer season. Their diet comprises exclusively of fish. Unlike Sea Eagles, who pluck fish of the surface of ponds and lakes, Osprey stoop vertically, feet first and submerge their bodies in the water when hunting. The close portrait shot above was taken at the International Centre for Birds of Prey in March 2018. This magnificent bird, is a common barn owl (Tyto Alba). With it silent flight, super-sensitive hearing and brilliant nocturnal vision, the barn owl is an sublime and efficient aerial hunter. Their golden colouring and beautiful heart shaped facial disk also make it one of our most angelic and attractive birds. Sadly, Barn Owl numbers are thought to have declined by at least 70% in the United Kingdom since the 1930's due to the loss of habitat and nesting sites. The photographs above were taken at the International Centre for Birds of Prey in Newent Gloucestershire, in October 2017. Firstly - an apology for the lack of recent updates. I regret to say that 2017 was a very difficult year for me, as my wonderful and much lover father passed away. During these very sad times, photography and the maintenance of this website has not been a priority for me . This year, I will be taking more photos and updating this site on a much more regular basis. This photograph of a Sumatran Tiger (Panthera Tigris Sumatrae) was taken at the Big Cat Sanctuary, in Headcorn Kent, on the 2nd June 2017. With their deep, rich colouration and sharp, piercing eyes, the Sumatran subspecies of the tiger is undoubtedly one of the most beautiful animals on the planet. Numbering just 300-400 in the wild, they are critically endangered, and organisations such as the BCS are critical to their future survival. This is Sullisker, a stunning Great Grey Owl (Strix Nebulosa) at the International Centre for Birds of Prey, in Newent, Gloucestershire. 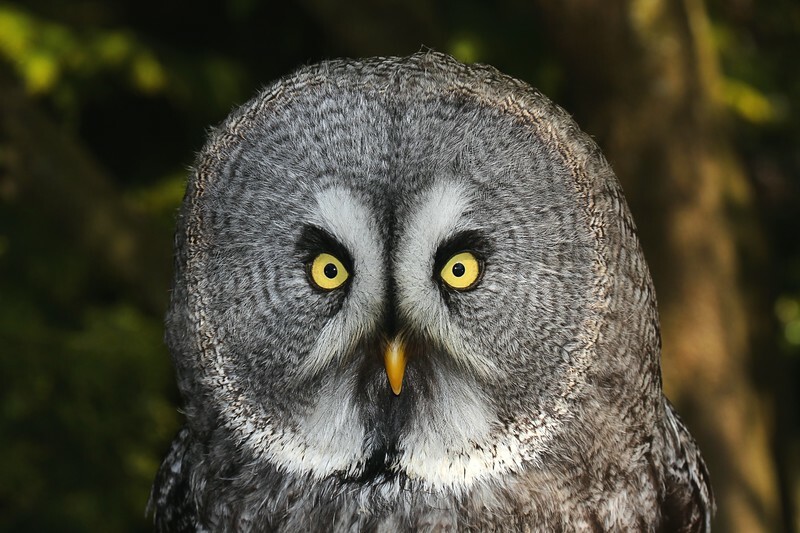 Often living in dense woodland areas, Great Grey Owls are one of the most photogenic birds of prey in my opinion. With the black and white circles on their facial disks and bright yellow eyes they ere almost hypnotic in their beauty, as this close portrait shows . This beautiful bird is an Abyssinian Eagle Owl (Bubo Cinerascens) - a species from the northern part of sub-Saharan Africa. The dark eyes are very striking, as it the black and white look. This shot was taken on the 9th April 2017, during my first visit of the year to the International Centre for Birds of Prey, in Newent, Gloucestershire. I've added a few more shots from this day to my Bird Gallery. I've always found her a tricky bird to get sharp photos of, so I am very pleased with this close in flight shot. This is one of my favourite places in Pembrokeshire, with the haunting ruins of Norman castle flanking the river and the tidal mill behind. This long(ish) exposure photo was taken on a cold February evening, when the tide was on the turn. When I look at it, I can’t help wondering whether the photo is a little too dark and cool, although I mu confess that I like it the way it is, as it reflects the sharp and moody atmosphere of the dusk when it was taken. This photograph was taken on the 13th August 2016 at the Wildlife Heritage Foundation/Big Cat Sanctuary at Headcorn, Kent. This stunning big cat is Tai'ri, a male North Chinese Leopard (Panthera Pardus Japonensis). I was very fortunate to get a lengthy sequence of photographs of Tai'ri eating his haunch of horse meat and putting on a stunning display of defensive aggression making it clear that nobody was going to take his food and he didn't appreciate the attention of being watched. This photograph was taken on the 9th August 2016 at the International Centre for Birds of Prey, in Newent, Gloucestershire. It shows a Turkey Vulture (Cathartes Aura) in flight. This was the first - and best - photograph that I managed to capture of this bird. I particularly like the lighting on this shot, with the hedge behind and the body of the bird being quite dark, but the face of the bird being nicely lit up by the summer sunshine. Vultures might not be the most visually attractive animals, but they are a vital part of the ecosystems where they are found. With digestive systems that can dissolve anthrax, botulism, and cholera bacteria they cleanse the environment and eradicate disease by removing diseased and decaying carcasses. Sadly, there has been massive decline in global vulture numbers in recent years, making them vulnerable to extinction. Organisations like the International Centre for Birds of Prey now play a vital role in vulture conservation.